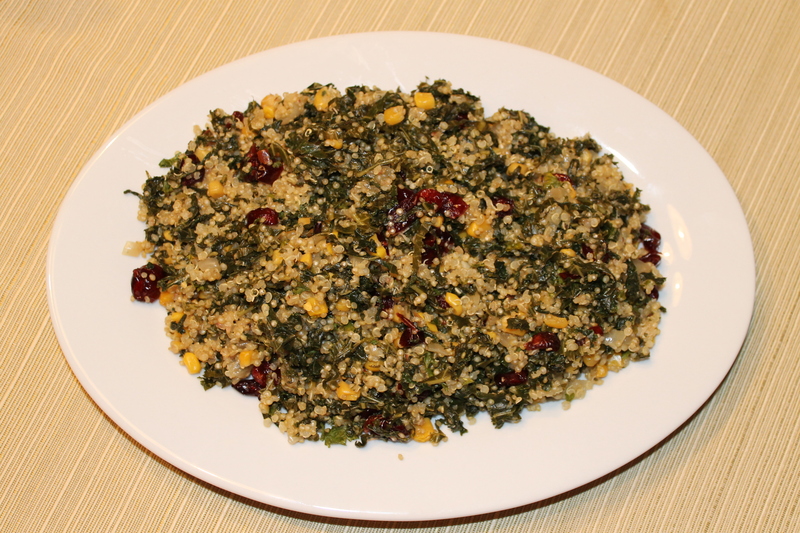 Easy Gourmet Recipes - Quinoa With Kale And Walnuts Recipe. Healthy natural recipes including breakfast recipes, appetizer recipes, soup recipes, pasta recipes, holiday recipes, party recipes, dessert recipes, gluten-free recipes, raw recipes and budget recipes. 1. Cook quinoa according to the package directions. 2. Meanwhile, in a large skillet heat olive oil, add onions and red pepper flakes and saute for 3 minutes or until onions are translucent. 3. Add garlic and lemon zest, cook for 1-2 minutes. Add white wine, stir and let simmer for 2-3 minutes. Add salt & pepper. 4. Add kale, 1/2 of the lemon juice and the pinch of nutmeg. Stir to combine and allow to cook over a low flame for 5-7 minutes, or until the kale is wilted and most of the liquid has been absorbed. Now add corn kernels. 5. Add the cooked quinoa to the kale mixture and gently combine. Turn off the heat and add the remaining lemon juice, parsley and toasted walnuts. Taste and add more salt & pepper, if needed. 6. You can also add some dried cranberries to it.